Freezing cookies is a great way to enjoy homemade cookies anytime. Simply prepare a big batch of your favorite cookie when you have time, then freeze the cookie dough or freeze the baked cookies to enjoy later. Here's everything you need to know about freezing cookies for the best results every time. What Kind of Cookies Freeze Best? Most types of cookies freeze well -- drop cookies, shaped cookies, refrigerator or slice-and-bake cookies, bar cookies, etc. Meringue cookies and delicate cookies are an exception. You can freeze filled cookies, such as thumbprint cookies and cookies that are coated in powdered sugar, such as Mexican wedding cookies either after they are baked or freeze the cookie dough. If you're freezing the baked cookies, wait to fill them or roll in powdered sugar until you're ready to serve. Should I Freeze Cookie Dough or Freeze Baked Cookies? In most cases, I prefer to freeze cookie dough over freezing baked cookies. That way, you still get the nice homemade smell and softness of the cookies when they come out of the oven. But if you want to get the whole job done, you can certainly bake the cookies, then freeze them later. Can I Freeze Sugar Cookies? Sugar cookies, like most cookies, can be frozen, but if you are planning to decorate your sugar cookies with frosting, freeze before decorating. As with most cookies, you can freeze sugar cookie dough or freeze baked sugar cookies. If you want to freeze the dough before baking, you can shape it into a disk (like pie dough) or log, wrap tightly in plastic wrap and put in an airtight container before freezing. Or you can do the rolling and cutting before you freeze the dough, then place the unbaked sugar cookies on waxed paper-lined cookie sheets. Freeze until firm (about an hour), then transfer to an airtight container. If you want to freeze baked sugar cookies, simply roll, cut and bake as you normally would. Let the cookies cool completely. Then freeze in layers, separated by parchment or waxed paper, in an airtight container (see tips on how to prepare cookies for freezing below). How Do You Freeze Cookie Dough? For drop cookies, such as chocolate chip cookies and shaped cookies, such as peanut butter cookies, portion out the cookies with a tablespoon or whatever the recipe calls for, then put the dough on waxed paper-lined cookie sheets and freeze until firm. This will take about an hour. You can put the cookies close together because they won't spread as they would in an oven, but don't let them touch. Then transfer the cookie dough balls or shapes to an airtight container, such as a zipper-sealed storage bag. For refrigerator cookies, sliced cookies or rolled cookies such as chocolate peppermint pinwheels, simply shape the cookie dough into a log, wrap tightly in plastic wrap, then put in a plastic storage bag and freeze. When freezing baked cookies, first make sure they are completely cooled. Now you can either wrap the cookies individually in plastic wrap, then put them in a sealed airtight container or plastic storage bag, or put the cookies in single layers, divided by waxed paper in an airtight container. I like to lay a gallon-size plastic storage bag on the counter, put in 10-14 cookies or so in a single layer, then, still keeping the storage bag flat on the counter, put a sheet of waxed paper on top, and put another layer of cookies on top and repeat. You can normally get 3-4 layers of cookies per storage bag this way, and they are generally airtight. What About Sandwich Cookies, Frosted Cookies, Drizzled Cookies and Decorated Cookies? 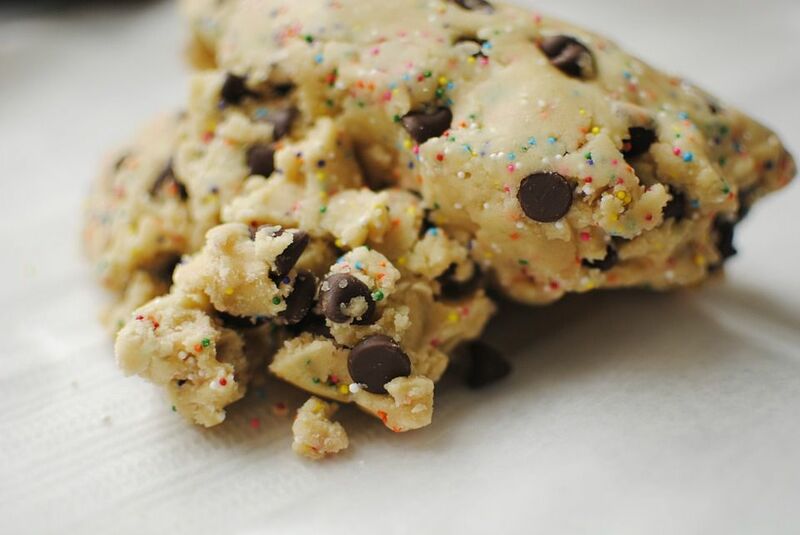 As with filled cookies or cookies coated with powdered sugar, it's best to freeze these kinds of cookies as dough, then bake and decorate as the recipe directs. How Do I Bake Cookies After Freezing? Drop cookies and any cookies you have already prepared into individual shapes can be baked right from a frozen state. Simply add a few minutes to the baking time. For sliced cookies, let the dough log thaw, unwrapped, in the refrigerator for several hours, or on the counter for half an hour or so, just long enough so that you can cut through the dough with a sharp knife. Then cut the cookies, transfer to cookie sheets, and bake as the recipe directs, adding a few minutes to the baking time. For rolled cookies, such as sugar cookies, let the dough thaw in the refrigerator or at room temperature until cold, but not too soft, and roll and bake as the recipe directs. How Long Can I Keep Frozen Cookies in the Freezer? At least one month and up to three months. The key is to wrap the cookies tightly in plastic wrap, storage bags or an airtight container. And don't forget to label your dough!